Standard accessory, its advantage is stable quality, durable material, and easy maintenance. Special design-Control PP straps cooling time. It can make the PP strap to fasten well in any time. “Electricity-saving” device, the motor automatically stops running after 60 seconds pause to reduce the regular mechanical wear and to prolong the machine’s life. The advanced P.C.B microchip circuit board control system, less malfunction and easy maintenance. Durable electro-magnetic clutch transmission means lesser mechanical wear and noise pollution. New heater plate design improves warm-up-time, welding speed and increase work efficiency. Installing an auxiliary feed switch and cut switch at the control panel makes you operate more conveniently. 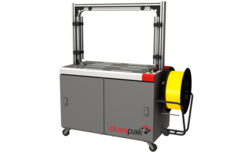 The Semi Automatic Pallet Strapping Machines eliminates manual tools and dispenser, which automatically feeds strap through the pallet void. Rapid speed: 2.4 sec/per cycle, 25 cycles/per min. These require minimum maintenance, no greasing and are easily operational. Can be adjustable at will, Max. Tension is over 90 kgs. Its components are made of aluminum alloy and Control System is compatible. Add on a safety device, built for 24 hrs continuous operation. Dispenser is placed outside to offer easier loading and unloading. Can be independent operation or combine with other machines for unmanned production or auto packaging systems. Decrease the dimensions of the package and transportation cost. 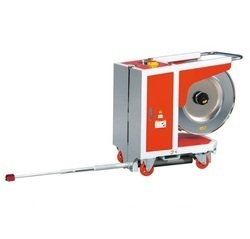 If the working height is between 730 to 800mm, the casters should be placed outside. Detection for strap not feeding to origin or arch properly. The breaker for electric leakage and safety switch. 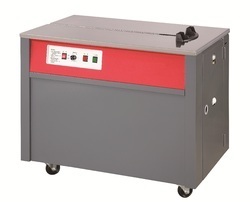 Option for 406Ø or 280Ø dispenser. Battery operated PET Strapping Tools are widely used in the export enterprises of iron, textile, foodstuff, merchandise, etc. These PET strapping tools adopts PET straps, which not only finishes a solder in a high speeds, but also is a high-tension, environment friendly solution for strapping. PET strap is a kind of new environmentally friendly strapping material to substitute steel strap and PP strap. The machine with very low table is suitable for the packages that are very large or heavy such as Automobile industries. 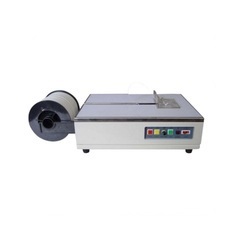 Box Strapping Machine offered provide for precise working performance and come with superior brush guiding mechanism that allows strapping at proper position. 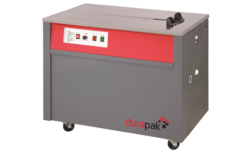 Offering consistent working, these systems provide support for rapid working speeds as well as require minimum maintenance. 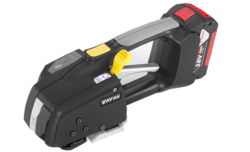 Looking for Strapping Machines ?